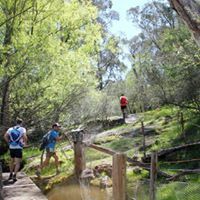 The 100 mile event, starts (6am) at the Henry Angel Trackhead, (some 9km south from Tumbarumba on the Tooma Road), going south towards Mannus Campsite. Mining relics and informative interpretive signs make the first part of the 100 mile beside Burra Creek extremely interesting, historically. To some it is the best of the HHWT. Sections of boardwalk, a swinging bridge over Tumbarumba creek, a tunnel blasted with dynamite through 70m of granite in1876 and views of the Australian Alps are just some of the interesting things to see along the way. Box, peppermint and stringy bark trees cover the landscape as runners make their way uphill to cross Mount Garland Fire Trail. Beautiful Mannus Lake, (which has a great new park on the foreshore and a new dam wall to replace the one washed away in a flash flood in 2010), and Mannus Campsite where runners turnaround to go back to Henry Angel Trackhead. From Henry Angel to Junction Campsite where this part of the course also follows Burra Creek gold and tin were also mined in the area. 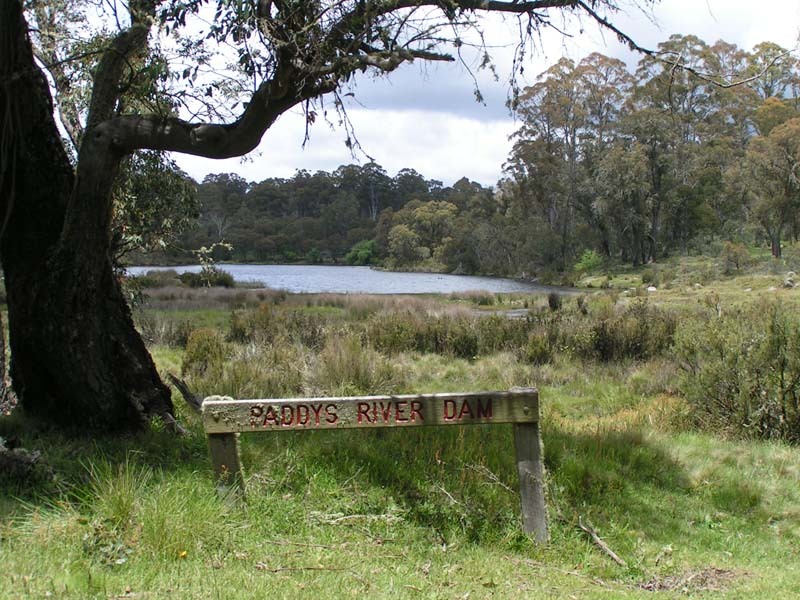 Paddy’s River Dam Campsite is considered by many to be the most attractive campsite on the whole track. It is used exclusively by fishermen, picnickers and campers. The dam was constructed in the early 1930s to impound water that was then taken by a 34 km water race to Tumbarumba and used to generate electricity, power an ice works and a saw mill. The water race is followed for about 11km. The more open areas around Paddy’s River Dam and Coffee Pot are a favoured haunt for brumbies, and the area supports a large diverse bird population. 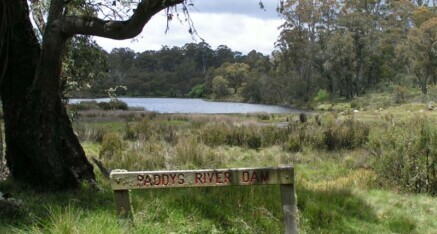 Paddy’s River Dam runners will reach a high part of the track,(1248m), and pass from the Murray Catchment to Murrumbidgee Catchment, where the water changes direction. The Pines is an experimental forest to see how the pines would grow in the area. Buddong Creek is crossed 5 times by the Hume & Hovell Walking Track. 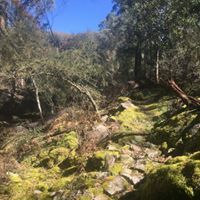 Buddong Falls, upper and lower falls are passed before the runners turn around at a style on the boundary of Kosciuszko National Park and freehold property, “Boraig”, to return back to The Pines. From here runners will head towards Granite mountain,the highest part of the course, (1400 mtrs, and you will also notice snow poles on the side of the fire trail) before returning back to The Pines to then make their way back through the Check Points to finish at Henry Angel Trackhead. The track is a mixture of constructed walking track, 90% single trail and the rest on fire trails. The 100km events start (6 am) at the Henry Angel Trackhead. The track is a mixture of constructed walking track, 90% single trail and the rest on fire trails. The highest point is over 1200 metres in elevation, Passes old gold mining relics, a hand dug tunnel, Mannus lake, Paddy’s River Dam, The Pines and lots of wildlife. The 100km will follow a section of the 100 mile course, cutting the distance at each end and no added loop, finishing at Henry Angel Trackhead. The 50 km event starts (9 am) at Henry Angel Trackhead. 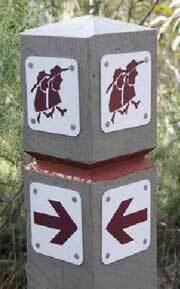 The 50km runs north, a short way along the banks of Burra Creek towards Junction campsite. Hovell recorded in his journal an extensive swamp littered with wombat holes. Runners today will notice a hugely altered landscape. The swamps have been sluiced away to win the gold. Runners make their way back through Henry Angel before going up over Mount Garland towards Mannus Lake, (recently repaired after a complete wash away by a flood in 2012), to turn around and make their way back to the finish at Henry Angel Trackhead. The course follows a mixture of single track and fire trails. The 22km event starts (10.30am) at Mannus Campsite. Runners will be bused from Henry Angel Trackhead to the start at Mannus Campsite. The 22km is run on a section of the 100 mile course. Mannus Lake looks a picture on the right, following single fire trails up and over Mount Garland, crossing the Tumbarumba creek on a spring bridge and on along the banks of Burra creek to the finish at Henry Angel Trackhead.